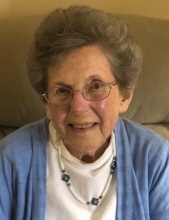 Elizabeth “Betty” Ann Mooi, 93, passed away on November 13, 2018. She was born June 22, 1925 in Detroit to parents William and Mae (Elzerman) Miller. Betty married Leonard Mooi on March 22, 1946 in Detroit and they had three children: Linda (Rev. Jim) Lester; Dr. Len (Karen) Mooi; Rick (Sue) Mooi. Betty was a potter and a gardener. For many years she was involved with the Volunteer Tutors Association (now: the Family Literacy Center); conducting tutor training workshops throughout the state. She was a member of the Imlay City Christian Reformed Church for over 60 years. Betty is survived by her children; their spouses; 8 grandchildren and 7 great-grandchildren. Her husband of 72 years, Len, passed away on July 27, 2018 as well as being preceded in death by her parents and siblings. Visitation will be 10-11AM Monday November 19, 2018, at the Imlay City Christian Reformed Church, 395 N. Cedar St., Imlay City 48444. Betty’s funeral service will immediately follow the visitation; 11:00AM Monday, at the church, officiated by Rev. Alex Snider and Rev. James Lester. Family will attend the burial later that day, at Hunters Creek Cemetery, Lapeer. Clark Road South of Hunters Creek Rd. "Email Address" would like to share the life celebration of Elizabeth Ann Mooi. Click on the "link" to go to share a favorite memory or leave a condolence message for the family.